I recently visited the Gab Titui Cultural Centre on Waibene (Thursday Island) in the Torres Strait to present the annual art awards sponsored by the National Museum of Australia at the 2017 Indigenous Art Awards. This year Gab Titui organised special celebrations to mark the tenth year of the Award, which has represented hundreds of artists from 20 remote communities in the Torres Strait and the Northern Peninsula Area. Patricia Williamson, Head of the National Museum’s Aboriginal and Torres Strait Islander Peoples team, standing with Leitha Assan, Exhibitions and Public Programs Manager; Dr Michael Pickering, Head of the National Museum’s Research Centre at back; standing with the Gab Titui staff. Matilda Loban, winner of the National Museum of Australia History through Art Award, with Patricia Williamson. The work conducted by Gab Titui in language and the arts is commendable and I am delighted to see the art awards continuing so strongly in their tenth year. 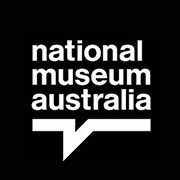 It is important that the National Museum continues to work with communities to ensure that programs such as the art awards are supported. These programs enhance cultural continuity in communities, which is one of the objectives of the Museum’s outreach. Matilda Loban from Badhu, Waiben and Poruma was the recipient of the National Museum award for her work entitled Ngulayg Lumayk, a photography and digital media piece exploring a young hunter and old hunting methods. High school student Danniel Gagai from Badhu was awarded the National Museum student award for her untitled work that pays homage to her family, especially her grandmother’s cultural links to Papua New Guinea. We acquired both of these works for the Museum’s National Historical Collection, as well as a suite of highly commended works by 14 secondary school students. Danniel Gagai, winner of the National Museum of Australia History through Art Award for a secondary student’s work, with Patricia Williamson. While in Waibene, I took the opportunity to catch up with Leitha Assan, who was one of the 2016 Encounters Indigenous Cultural Workers Scholarships recipients. I was delighted to witness first-hand Leitha’s excellent curatorial work at Gab Titui, and to hear Leitha’s reflections on the benefits of the scholarships. ‘It’s a wonderful opportunity. Looking back over six months there have been a lot of successful outcomes for all of us, and that’s wonderful to see,’ Leitha said. ‘We hit the ground running when we got back home. The recipients have all stayed in contact and we encourage each other in our different projects. ‘I learned a lot of things during the scholarship that built on my skills and the networking opportunities were valuable. ‘I have since been in touch with the British Museum in regards to images for a recent exhibition. I’ve been communicating with Cambridge to set them up with local artists for ghost net commissions as well as the Horniman Museum in London.